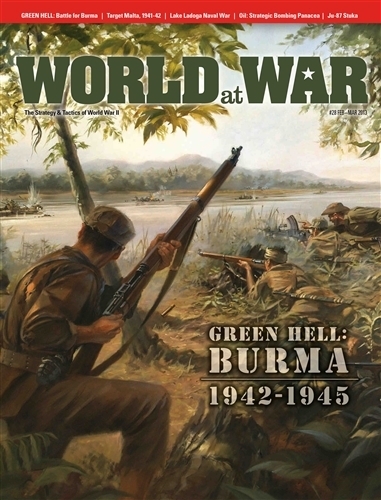 Green Hell: An analysis of the Allied offensives to retake Burma from the Japanese during 1943-1944. Emphasis is placed on the role of the commando-style operations of the British Chindit and the US Merrill's Marauder units. Stuka: Analysis of the capabilities and significance of this legendary gull-winged German ground attack aircraft. Technically obsolete from 1940 on, it still went on to provide excellent service throughout the rest of the war, particularly in the war in Russia. Lake Ladoga Naval War: The story of a little known portion of the eastern front during which Axis and Soviet gunboat flotillas fought it out on this large lake northeast of Leningrad (Petersburg) from late 1941 to 1944. Strategic Bombing Panacea: In-depth analysis of what the British and Americans hoped to gain from their bombing campaign against Germany, what the effects really were, and why there was such a difference between expectations and outcome.